In this fantasy, a favorite of writers, particularly, we fancy ourselves sitting at a sidewalk café, scribbling way, waiting for our friend Hem (otherwise known as Ernest Hemingway), or maybe dropping by to say “hello” to Sylvia Beach, the American proprietor of Paris’ most famous bookshop. With a proliferation of book shops on the Left Bank, isn’t it interesting that Shakespeare and Company, overseen by an American, became the most famous? In Chasing Sylvia Beach , a 23-year-old book seller from Denver gets her chance to live that fantasy. Note: author Cynthia Morris was once a bookseller in Denver who traveled to Paris many times, studied Sylvia Beach, but as far as we know, time-traveled only in her imagination. The novel follows Lily as she gets on a plane for Paris in 2010 and lands in Paris 1937. In the novel that ensues, Lily finally does interact with Sylvia Beach, Stephen Spender, Hemingway, and others. When she wrangles a job with Beach, Lily volunteers to go pry Hemingway out of a bar where he is hiding with a case of nerves over a reading arranged at the bookshop. She made herself tipsy with a fantasy of befriending the great writer. She hurried to the corner, on a mission to get her friend Hem. He counted on her to help him with these kinds of events [a book reading that scared him into a bar]. After the reading, they’d go together with friends for drinks and she’d get him to reveal his editing secrets. He’s share his writing tips, encouraging her efforts. She’d blossom under his tutelage and become a famous writer in her own right. Much more of the book is devoted to the mystery of how and why she became an involuntary time traveler. For my taste–or my fantasy, perhaps–author Cynthia Morris spends way too much time on the internal monologue of Lily and too little on the extraordinary literary world of the 1930’s Paris. But this is a book about a young woman finding her way in the world–complicated by finding her way through time. 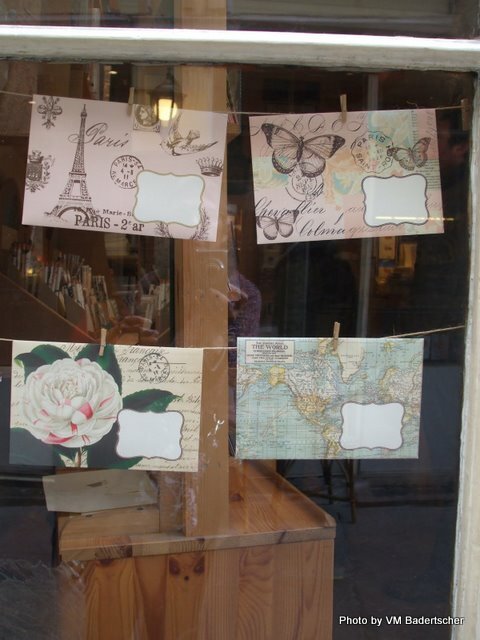 But wouldn’t you rather peek at the literary greats of the day, as Lily could working at Shakespeare and Company? A man wearing a shabby white suit and thick glasses entered with a sad-looking woman. They greeted Sylvia coolly. She returned the man’s hello and smiled warmly at his wife. As he made his way to his seat, Lily realized it was James Joyce. He appeared skinny and sickly, but carried himself like someone important. The self-involved Joyce walks out before Hemingway starts his book reading, and Lily learns about the falling out between Joyce and Beach, who brought Lady Chatterley’s Lover to print. Morris had the tricky task of observing Paris–but Paris of the 1930’s rather than today’s Paris–and she does it well. 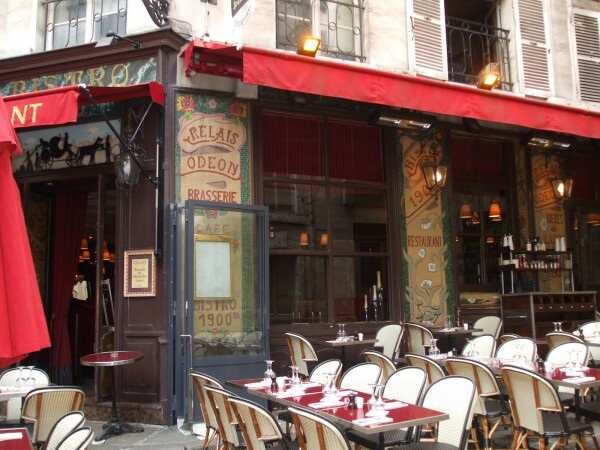 The book is mostly set around the Latin Quarter, where Beach oversaw Shakespeare and Company on Rue d’ Odeon. Today’s reincarnation of the store lives closer to the Seine, but still in the same general neighborhood. 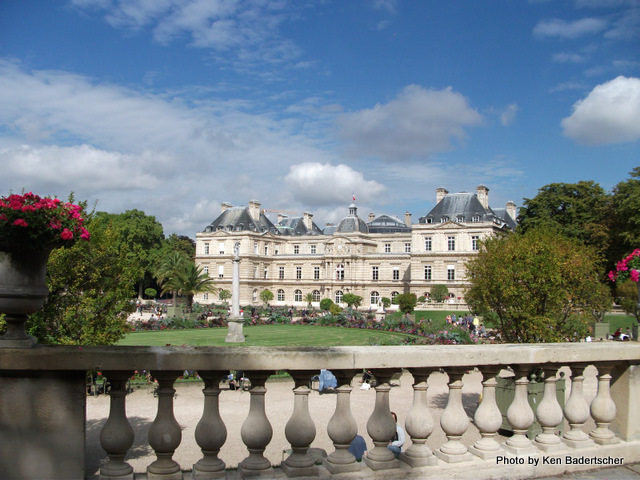 The Luxembourg Gardens (pictured above) provide a setting for many scenes in the book. Lily gives us an interesting view since she can compare the 1937’s Paris to the Paris of the 21st century where she briefly attended school. Therefore, she becomes entranced with the ornate ironwork of Les Halles, which had been torn down in her future life., to her. If you are confused, don’t worry, Morris does a better job of this time-traveling stuff than I do. And fortunately for the traveler who reads this book, Paris’ many charms includes its timelessness. 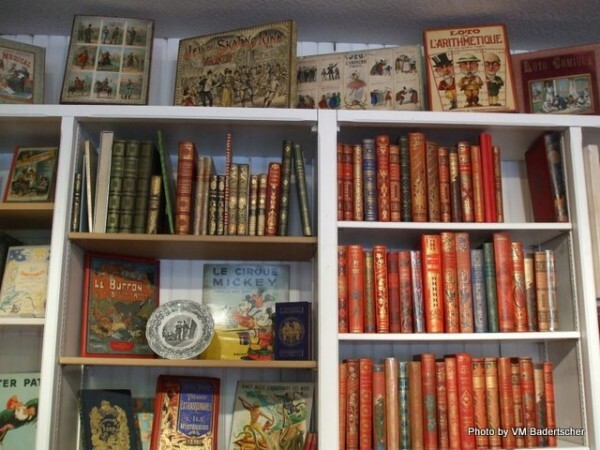 Antiquarian children’s book store, near where the original Shakespeare & Co stood. One of her major challenges is not to let 21st century language slip into her conversation. Hemingway chastises her for the use of too many words–one of which, of course, is “like”. She confuses Sylvia Beach by references to credit cards and ATMs. This is a first novel for Morris, who coaches women to free their inner writing genius, and for the most part, it is a good first attempt. The descriptions are fresh and true (to use Hemingway’s favorite word for good writing). For instance, have you ever felt this when you hear only a foreign language around you? …only the din of voices, devoid of meaning, flowed around her. French sounded like a river, rushing and certain, always in a hurry to get somewhere important. Parisian conversation was heavy with emphasis, couples overriding each other’s statements, voices rising, smacking against each other like water against rocks. In this video, Morris discusses her view of the book. Disclaimers: The book was provided by the author for review, which never influences what I write. The links to Amazon are here for your convenience. Although it costs you no more to do your Amazon shopping through our links, you will be supporting one of your favorite websites because we are an Amazon affiliate. The photographs here are my property, and I appreciate your respect for my copyright. Thanks so much for this thorough and kind review, Vera. I appreciate your care and thoughtfulness, and I’m glad you enjoyed the book enough to share it with your readers. How lovely of you to drop by, Cynthia. I’m fascinated by the work you do coaching women writers (or those who are afraid to get started.) Hope some of the readers here will check out your website.